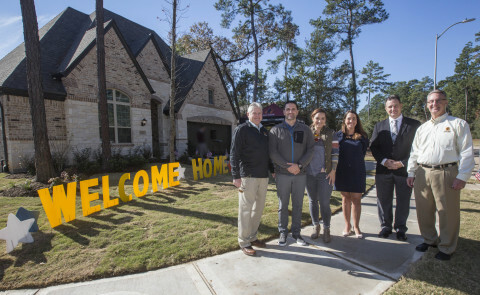 HUMBLE, Texas--(BUSINESS WIRE)--When Marine veterans USMC Corporal Michael Byrne and his wife, Michelle, along with their two children, join the community of Humble, Texas, they will be moving into a new, custom-built, mortgage-free home. Cpl. Byrne, who is retired from the U.S. Marines, benefits from a $7,850 Housing Assistance for Veterans (HAVEN) grant from the Federal Home Loan Bank of Dallas (FHLB Dallas) and Texas Capital Bank to offset construction costs. The grant helped fund their home, which was provided by Operation FINALLY HOME, a nonprofit dedicated to honoring American veterans with custom-built, mortgage-free homes, along with Highland Homes, Ashlar Development and the Greater Houston Builders Association. Cpl. Byrne enlisted in the U.S. Marines in 2005 after graduating from high school. While he was stationed at Camp Pendleton, California, he met his wife, Michelle, also a Marine veteran. In 2006, at the age of 20 years old, he deployed for the first time to Iraq, followed by two deployments to Afghanistan. Over the course of his service, Cpl. Byrne experienced eight IED blasts that left him seriously injured. He medically retired in 2013. Today, he suffers from Post-Traumatic Stress Disorder (PTSD), Traumatic Brain Injury (TBI), migraines and several other injuries due to combat. His injuries make it difficult to work, but he’s pursuing a college degree focusing on community planning so he can help homeless military veterans in the future. Cpl. Byrne received numerous awards and medals during his time in the military, including the Combat Action Ribbon, the Navy Meritorious Unit Commendation Medal, two Marine Corps Good Conduct Medals, the National Defense Service Medal, the Afghanistan Campaign Medal with four service stars, and the Iraq Campaign Medal with two service stars. The Byrne family received the keys to their new home today at a dedication ceremony. HAVEN is a distinctive grant program offered by FHLB Dallas through its member institutions, such as Texas Capital Bank, that reaches out to veterans and active-duty service members who have been disabled in the line of duty since September 11, 2001. It provides grants up to $7,500 to support necessary home modifications. To qualify, veterans must also meet income eligibility requirements. This year, FHLB Dallas has made available through members $75,000 in HAVEN grant funds. The program launched in 2011 with $250,000 set aside for the program. To date, more than $340,000 has been awarded through FHLB Dallas members to assist veterans and service members with their housing needs. Melanie Dill, FHLB Dallas community and economic development product manager, said HAVEN is a unique program because it provides important services only to those who have served in the military. Texas Capital Bank, N.A. is a commercial bank that delivers highly personalized financial services to businesses and entrepreneurs. We are headquartered in Texas working with clients throughout the state and across the country. Texas Capital Bank is a wholly owned subsidiary of Texas Capital Bancshares, Inc. (NASDAQ®: TCBI) and is recognized as a Forbes Best Banks in America and the Dallas Morning News’ Top 100 Places to Work company. For more information, visit texascapitalbank.com. Member FDIC. U.S. Marine veteran Michael Byrne received keys to his new home today, funded in part by a $7K grant from Texas Capital Bank & FHLB Dallas.